The 2012 Global RallyCross season championship came down to a shootout between Ford drivers Tanner Foust and Brian Deegan at the 6th event of the year and when the dust cleared outside of the 2012 SEMA Show in Las Vegas - Top Gear host Tanner Foust ran away with the win and the 2012 GRC championship. After Tanner Foust took his first win of the 2012 Global RallyCross season a few weeks ago at Las Vegas Motor Speedway, he put himself in a very good position to win the 2012 championship. Only fellow Ford racer Brian Deegan was close enough in total points to catch Foust in this week’s finale in front of the 2012 SEMA Show. Deegan has been strong all season but so has Tanner - setting up what would prove to be the RallyCross equivalent of a heavyweight title fight in Sin City. The racing for stop #6 on the 2012 Global RallyCross season began on Monday night when the 14 drivers each ran a heat race to determine the starting grid for Tuesday’s main event. 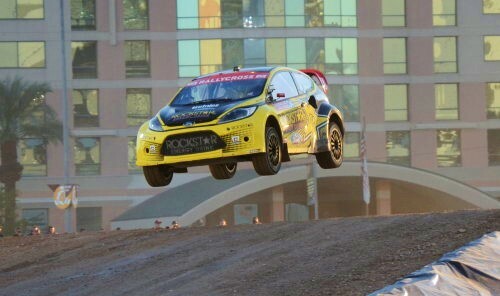 Tanner Foust came out hard, setting the fastest time of the qualifying round as he beat Toomas Heikenen and Rhys Millen but Brian Deegan answered with a great time of his own; ranking second only to Foust. While running the second quickest time of the first round, Deegan beat out Samuel Hubinette, Sverre Isachsen and Dave Mirra. The other two early heats had Ken Block taking the win over Pat Moro and Bucky Lasek while Timur Timerzyanov bested Stephan Verdier, Bryce Menzies and Liam Doran to complete the starting grid for the 2 heat races on Tuesday. The first heat race of the Tuesday GRC race saw a very strong Ken Block take the early lead and he never looked back - winning the heat and advancing to the main event along with Samuel Hubinette, Bryce Menzies and Dave Mirra. Brian Deegan, Pat Moro and Sverre Isachsen were forced to move on to the Last Chance Qualifier (LCQ). Bucky Lasek advanced to the finals with Foust while Liam Doran, Stephan Verdier and Toomas Heikkinen would head into the LCQ. When Brian Deegan had a tire come apart during his first heat race of the night, there was a chance that Tanner Foust would have an easy stroll to the championship but Deegan made sure that wouldn’t happen as he made short work of the 6 car field in the Last Chance Qualifier to advance to the finals while Toomas Heikkinen grabbed the second spot to advance along with Deegan. The 10 car final race of the 2012 Global RallyCross season saw Ken Block and Tanner Foust quickly pull away from the field. Over the course of the race, Foust and Block had a great battle going until Block ran into mechanical issues as he approached the large jump gap. Block’s Monster World Rally Team Ford Fiesta rolled to a stop as smoke billowed from the car. This brought about a red flag as the safety crew jumped to make sure that the car didn’t catch fire and to make sure that Ken Block was uninjured. The lengthy process of removing Block’s car from the track led the GRC officials to make a surprising call - to run the entire final race over again. The final-final went much like the first run with Tanner Foust quickly pulling away from the field but Brian Deegan wasn’t going to let him have an easy win. Deegan never quite got close enough to challenge for the win but he ran hard enough to make Foust work for the win. Deegan settled for second while Rhys Millen came in third. With his second win of the 2012 GRC season, Tanner Foust secured the 2012 championship while also tying up the manufacturer’s championship for Ford Racing. Congrats to Tanner Foust and his team on an incredible 2012 Global RallyCross season that finished up with back to back wins en route to the 2012 championship! Tanner and Seby Loeb are the two best drivers alive today. Maybe the two best ever.